SRC Solutions Announces PowerSchool User Group Gold Sponsorship for 2016. SRC Solutions Gateway Suite is a Gold Sponsor of the PowerSchool User Groups for 2016 providing school districts with cohesive integrated solutions for PowerSchool. SRC Solutions is excited to expand the relationship with PowerSchool districts across the world with these new and innovative solutions. SRC Solutions is excited to announce Gold Level Sponsorship for the National PowerSchool User Group Conference starting July 18th as well as every PowerSchool User Group Conference thus far in 2016. SRC Solutions has been providing integrated solutions for PowerSchool districts since 2010 and will be showcasing two additions to the SRC Solutions Gateway Suite. Many PowerSchool districts have come to know SRC Solutions for the Registration Gateway platform which provides seamless data integration to PowerSchool customers for online student registration as well as integrated direct scan document capture technology. At this years' National PowerSchool User Group Conference, SRC Solutions will be presenting the following complementary solutions to Registration Gateway. Safe Kids Gateway is a solution born from the need for a uniform solution to capture volunteer and employee safety clearances in schools, towns, camps and sports. Safe Kids Gateway provides your company, school or organization a simple and effective way to clear employees and volunteers through what is today a cumbersome, ineffective and unsecured paper process. Safe Kids Gateway manages the information intake, approvals, notification and record tracking. 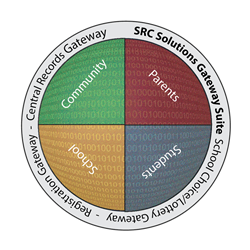 Central Records Gateway Student Records Management is a multi-faceted platform where districts can accomplish many tasks with the click of a button. Instead of storing documents in warehouses and filing cabinets, school administrators can access them via Central Records through email, text, phone, tablet or computer. Central Records Gateway can even be expanded beyond the student record to incorporate Human Resources and Business Office records. "SRC Solutions is excited once again to be a Gold Sponsor for the National PowerSchool User Group Conference. Our philosophy all along has been one of redefining school district workflows for efficiency and cost savings. PowerSchool users are some of the most instrumental K-12 educators at positively affecting change in efficiency for their school districts and we are excited to continue partnering with these districts now and in the future." said Patrick Maher, CEO, SRC Solutions, Inc.
SRC Solutions’ flagship product Registration Gateway has had a long and successful partnership with K12 school districts. Being a technology leader is nothing new to SRC Solutions. Going all the way back to 2008, Registration Gateway was one of the first Online Enrollment solutions to offer real-time data integration to Student Information Systems and integrated document scanning and management. PowerSchool User Group is a collection of users of PowerSchool software across the world and not affiliated with PowerSchool Group LLC. PowerSchool users provide informational sessions to allow other users to learn from their experiences in their every day use of the application.